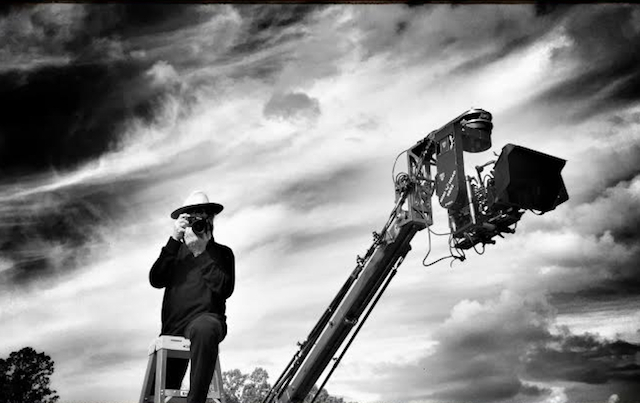 When I noted that it was Uncle Dale who shot the most iconic film photo of last year, I knew it was time – via an interview on HollywoodChicago.com – to appropriately have him tell the story of the photo, especially as “La La Land” anticipates Oscar Night on Sunday. He also spoke of his profession, and his blessed life in show business. 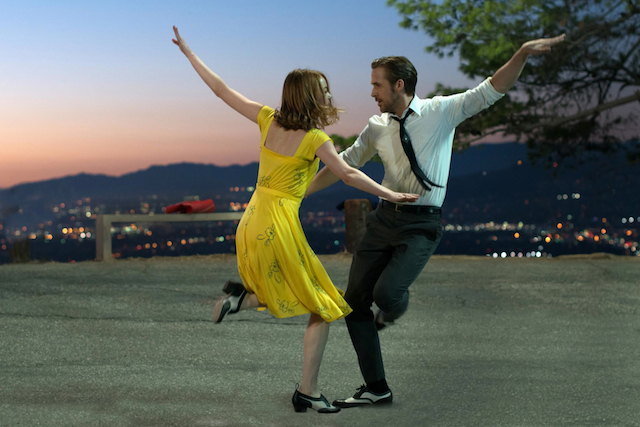 HollywoodChicago.com: What was the process, when you were on the set, for capturing the iconic photograph of Emma Stone and Ryan Gosling in ‘La La Land’? Dale Robinette: First, it was fascinating filmmaking, on the first of a two evening shoot when we arrived at the Burbank side of Griffith Park at 3pm, and were shuttled to the location for the dance scene. There was a techno-crane there, a telescoping filmmaking instrument that goes from 12 to 40 feet in three seconds or so, with a camera on the end loaded with a 1000 foot roll – which is 6 minutes of film. The crane can also sweep up to 300 degrees or just pan left or right. Our Director, Damian Chazelle, wanted his shot to be like a golden age musical, by framing Emma Stone and Ryan Gosling from head to toe. That afforded me a modest bit of room to work, as the camera was not on top of the talent, and was remotely operated. After rehearsing with stand-ins, Ms. Emma and Mr. Ryan began the dance sequence just as the light was perfect – “The Golden Hour” – we only had two tries with the city lights and when the was sky so sublime. We returned the following evening for two more takes. I will come back to this moment later in our talk. HollywoodChicago.com: So during those two nights, what was your assignment, and how were you positioned? Robinette: My job was to capture various moments in the dance. After enjoying “La La Land” at a recent screening in Hollywood, I realized the pose I captured was less than a second. The fact that still photographers are still on sets today is because a film camera could never capture Emma and Ryan’s feet, even if you went frame by frame. Their feet and hands would be in rapid motion and would be blurred. A film camera shoots at a 50th of a second shutter speed. I can alter the speed on my still camera and was able to grab three or four shots in that pose. The studio selected that shot, and I was pleased. The photograph seems to be everywhere. The film itself is a modern day classic and will not only be discussed for decades …but also loved. HollywoodChicago.com: Much of movie making is encapsulated in the saying ‘hurry up and wait.’ How does that apply to a Unit Still Photographer? As far as ‘hurry up and wait,’ I do a lot of behind-the-scenes shooting. If you look at any typical website for a film you will see images like the director speaking to the actors. The photo editors at the studios often judge a still photographers worth – not by the usual shots of the movie scenes – but by their unusual images of behind the scenes. HollywoodChicago.com: Besides websites, what are some other uses for the pictures you take? Robinette: Well, the other day somebody sent me a link. There is my picture of Emma Stone and Ryan Gosling in front of a coffee shop on the Warner Bros. studio backlot – where Emma’s character is a barista early on in the film. The image is accompanied by a quote said by Ryan, ‘This is the dream… it’s conflict and compromise and it’s very very exciting.’ The ad goes on to entice with…. ‘and you too can sit and revisit the set where dreams come to life at the Warner Bros. Studio Tour.’ It was just a great promotion. Also yesterday, Lionsgate [“La La Land” producer and distributor], sent me a series of my images as a ‘LA LA LAND STICKERS’ APP for screenshots in iMessage – apparently it has been an APP sensation. HollywoodChicago.com: Who or what was the key moment in your unit photography career that propelled you from the early days in the 1980s and ‘90s doing TV movies and horror films to more mainstream features like Donnie Darko? Robinette: There was no specific moment. I never had a ‘five year plan’ or such…I just stumbled along. As I sharpened my skills, there were people who remembered me and in the movie business it’s a who-you-know, what-you-know, and-what-you-do kind of world. To me, there was no ‘decisive moment’ – I’ve just moved from movie to movie like most freelancers – but I’ve been very blessed lately. HollywoodChicago.com: What best describes your role as a Unit Still Photographer on a typical movie set, as in when you step in and why? Robinette: My method is when the cameras are rolling, that is when I do my work. I try to camp next to the “A” camera, and if the angle isn’t good, I’ll ask the First Assistant Director for 30 seconds at the end of the scene to get “The Shot” – because there is not going to be another opportunity. HollywoodChicago.com: In which films have you photographed a particular actor or actress, and then experienced them moving up the spectrum as movies stars, and what quality do you notice about those types of people that make them stars, in your opinion? I worked with Jake Gyllenhaal on ‘Donnie Darko,’ and he had charisma, talent and has made some very brave choices in his career. At one point, he was going off to do a BIG film, ‘Prince of Persia,’ for Walt Disney Studios. I worked with him again after he did that film…and he told me from then on he wanted to focus on character driven films. HollywoodChicago.com: Which type of film set is most comfortable for a Unit Still Photographer, and which types make your job the most difficult? Robinette: Basically I love to have room to work – it’s a nightmare working in a small set in a hot room with 30 bodies – and me sandwiched between actors and crew. I’ve been elbowed out of the way more than once by a belligerent boom man. HollywoodChicago.com: What’s an example of your presence on the set when you were unusually noticed? Robinette: I was on a film a few years back called ‘No Strings Attached,’ which was directed by Ivan Reitman and featured Ashton Kutcher and Natalie Portman. There was a scene where Ashton’s character was presenting a ‘bouquet’ of carrots to Ms. Portman. I was next to the camera position, but it wasn’t working as an over-the-shoulder photo angle for me, so I scooted around to get a two-shot angle. And suddenly I looked up and Ivan was saying, ‘put a camera where Dale is.’ [laughs] They ended up shooting the same two shot. HollywoodChicago.com: As a character actor, you were on a soap opera [‘Search for Tomorrow’] and had a pretty good run at parts on iconic TV shows like ‘Kojak,’ ‘Starsky and Hutch,’ ‘Hawaii 5-0,’ ‘Laverne & Shirley’ and ‘The Rockford Files.’ What was the process of landing those shows for a working actor during the 1970s? Robinette: I started on the stage in New York City, and was blessed to get enough work in commercials…so I didn’t have to wait tables or starve. I made the move to Los Angeles, and that was a whole different world. Yes, I did all those TV shows – had an agent – and I got roles through word of mouth, which ended up how I get my photography work. And as long as I hit my marks and didn’t show up drunk, I kept working. [laughs] I don’t know if God gave me the even good skills as an actor, but He did give me a good eye. HollywoodChicago.com: Of any of the great studio films, made between let’s say 1939 through the end of the era up until the early 1960s, which one would you have liked to have been a Unit Still Photographer on, and why? Robinette: I’d have to say ‘To Kill a Mockingbird.’ I love that it’s in black-and-white, that the director Robert Mulligan had such a keen eye, that it featured Gregory Peck, and that it contained the vision and words of author Harper Lee. As an aside, I happened to know the Art Director on that film, Henry Bumstead, and he won an Academy Award that year. He also was Clint Eastwood’s favorite man and worked with him until he passed away in 2006. I loved the courtroom drama, the period costumes and the humanity of “To Kill a Mockingbird.” The story transports us away from the hectic world we live in to a simpler time, that was more civilized. Robinette: Yes, so going back to the dance sequence on the second night after the second and final take…there was a spontaneous outburst of jubilant shouting and joyous hugging, as everyone knew we had nailed it. It was great, indeed – and that final flawless take is in the film.